"A Turkish Angora watching a Bird"
"Turkish Angora ... the ballerina of the cat fancy!" The rare Turkish Angora cat have a natural elegance, and became a treasured gift within the 18th Century aristocracy. As was the case with Louis 15th and Marie-Antoinette, one should own at least one of these cats to maintain one's ranking. Numerous artists were also fascinated by the cat's beauty. The Turkish Angora cat is the most ancient of the naturally occurring breeds of cat, and also is believed that is the oldest longhair breed in the world. 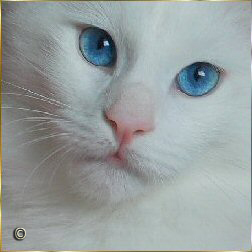 Historically and traditionally, they are typically as a pure white cat, with blue eyes, ODD-eyes, and amber eyes. In Europe, when the breed was shown in the first time, having a pure white Turkish Angora was considered a status symbol. 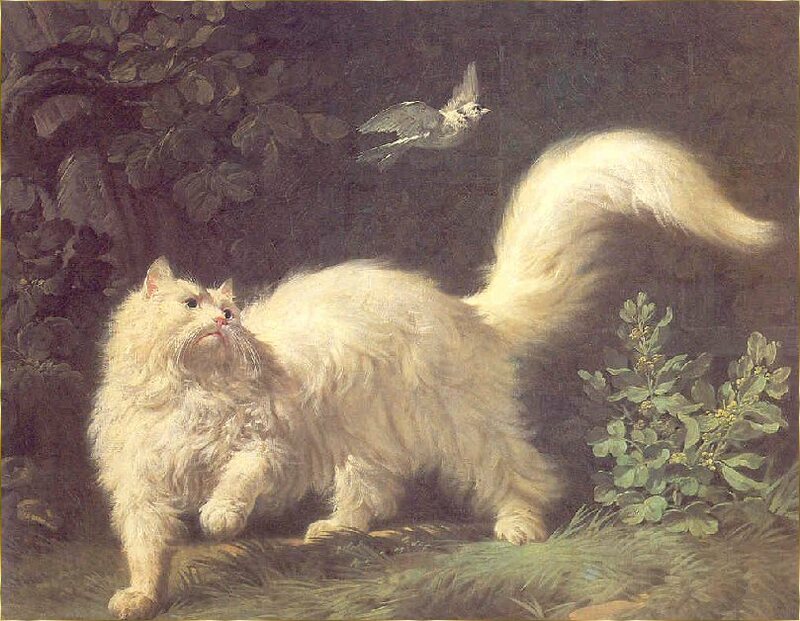 The artist Jean-Jacques Bachelier did a beautiful paint of a Turkish Angora cat in one of his works, named "A Turkish Angora watching a Bird". 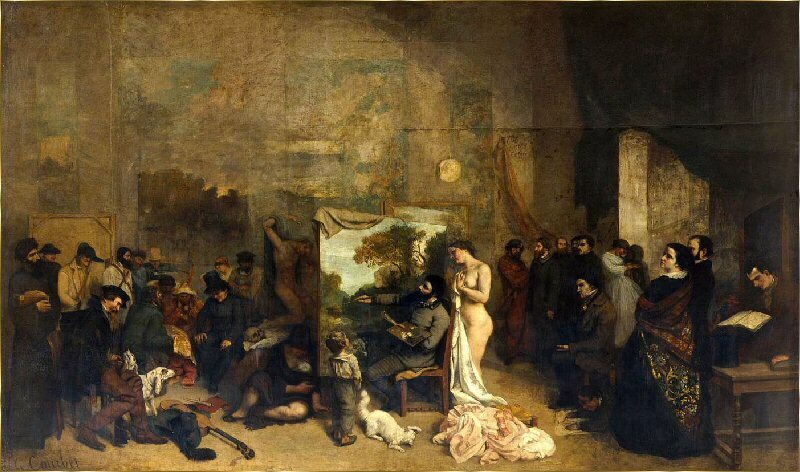 The cat also appeared on many 19th Century works of art such as Gustave Courbet's in 1855 (Painting workshop) representing a Turkish Angora sitting at the feet of the artist and his model. The cats also appeared in the naturalist works of Linné and Buffon who recognised them as a breed of their own, and named them "Catus Angorensis" alongside the domestic cat and Chartreux. Writings dating back 1856 by M. Lottin de la Val, President of the Imperial Aclimatation Society evoke the colour diversity of the Turkish Angora's coat in the breed's country of Origin. The Turkish Angora is originated in the Ankara region of Turkey, formerly known as Angora. The Turkish Angora is known to have existed in Turkey way back in the fifteenth century, although there are different stories about how it arrived there. Some say the Vikings introduced it as long ago as the tenth century (and it became one of the foundation breeds for today's longhaired Persians), whilst there are other stories claiming that it arrived with the early Egyptian traders. There are known to have been Turkish Angoras in Britain from the 1500's, when Turkish Sultans offered them as gifts to the nobility of France, Italy and England, but as the long haired Persian gathered popularity during the nineteenth century, so the traditional Turkish Angora became very rare in America and Europe. The Turkish Government became concerned about the decline of the Angora and set up a breeding programme at Ankara Zoo in the early 1900s to preserve the white 'odd-eyed' Angora, regarded as the national cat of Turkey, and is often given as a good luck cat. The Ankara Zoo began a massive undertaking to save and protect the Turkish Angora, one of the two native Turkish breeds of cat. They concentrated on the whites, and bred whites with blue eyes, gold eyes and odd eyes. The zoo kept these cats in impeccable condition and their breeding program was both scientific and genetically sound. They kept exact records but were extremely reluctant to let any of their Turkish Angoras go elsewhere. The Turkish government and people took great pride in this breeding program. 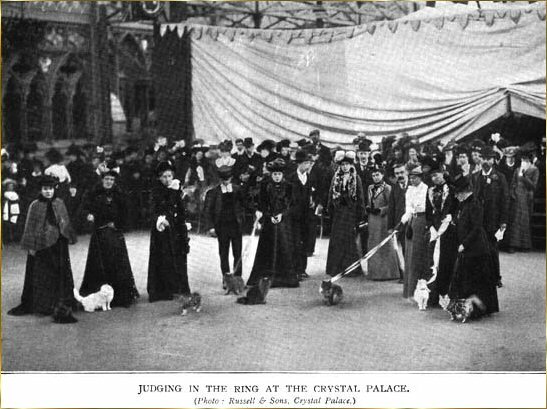 Harrison Weir, a famous authority on cats and the founder of the modern cat fancy, organiser of the first UK cat show at Crystal Palace in 1871, described them in his book "Our Cats and All About Them", which was the first book about pedigree cats. Picture from the book "The Book of the Cat", by Frances Simpson, published Cassell and Co., Ltd. The Cat Fanciers Association (CFA) accepted the breed in 1973, and only the white color was recognized at this time. Years after, in 1978, several other colors were recognized by CFA, and were included in the breed standard. The elegant Turkish Angora is called the "Ballerina" of the cat fancy, due to gracefulness. These graceful cats dance into your life with their fine-boned elegance draped in a gossamer silk coat in a variety of colors (solid, tabby, silver/smoke, solid and white, tabby and white, silver/smoke and white, and pure white, except pointed, and those based on chocolate, lilac, cinnamon and fawn). The possible solid colors are white, black, blue, cream, and red. 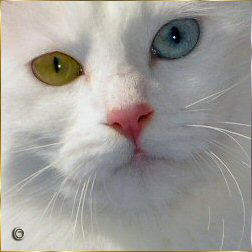 The eye colors in the Turkish Angora cats can be amber, gold, or in various shades of blue or green. The eyes can also be odd-eyed with one blue and one green, amber, or green-gold. The more vivid, and deep colored eyes are prefered. These energetic cats have a regal bearing but eagerly welcome visitors who come to pay tribute to them. The strikingly beautiful Turkish Angora has a long history in its native land and is considered a national treasure-and owners of these elegant, affectionate cats also consider themselves fortunate to own one of the gems of the cat world. The Turkish Angora may look slender and delicate but is has a body of solid muscle and stays fit by exercising its hunting instinct chasing through the house in pursuit of its toys. They are extremely agile like the ballerinas they resemble and will be found in unexpected high places like the top of door! These outgoing affectionate cats is interested in everything you do and wants to help you-and they expect you to be interested in everything they do and to help them. Ignore an intelligent Turkish Angora and you can expect it to engage in activities designed to make you pay attention-like batting one coaster at a time off the table until you stop what you are doing and pay attention to it. They are happy to have other pets around as long as they recognize the Turkish Angora as the boss. The coat of the Turkish Angora is medium long, and has a single coat with no undercoat which makes this longhair cat easy to care for. The coat has seasonal variations but even when shorter, it should be soft and silky with a flow when the cat is walking or running. 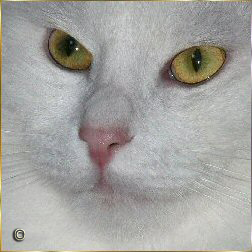 Sometimes "White" kittens are born with a small darker mark on the top of the head, known as "kitten caps", which will disappear early, or even by around 12 to 18 months old. These common color marks of the solid white kittens are located only on the top of the heads, and they are not "Van" markings, and they are not permanent. The darker colors markings, and larger patches do tend to take longer to disappear totally. The groundwork was laid by a very hard working group of breeders who loved and respected this most unique and interesting breed. The breeders and owners of today’s Angoras should thank and remember them for their efforts to keep the breed alive, and recognized by the cat fancier's.